Lap records at the famous Nürburgring have been hovering in the low seven-second range for years now. It seemed like production cars had reached the limits of design until Lamborghini blew everyone away. The time to beat is now 6:52.01, thanks to the new Huracan Performante. This raging bull makes use of forged composites to shed weight. Still made of carbon, the Huracan materials are thinner with the same strength. The result is a loss of 88 lbs of curb weight. Active aerodynamics are programmed to react in 500 ms in order to control downforce. It also creates less drag, which increases acceleration and top speed. It only takes 2.9 seconds to reach 62 mph, and you will be capable of over 202 mph. The 5.2-liter V10 now makes 640 horsepower and 442 lb-ft of torque. 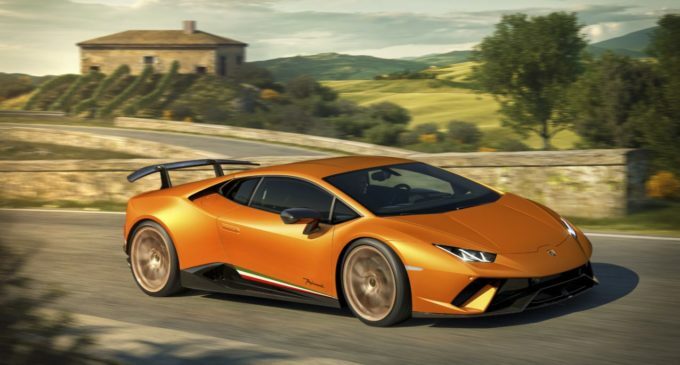 With a dry weight of 3,046 lbs, the Performante is the state-of-the-art in lightweight motoring. To set a new lap record, it required significant advances in aerodynamics. They proved so shocking that Lamborghini has patented the system. It is named ALA, which stands for Aerodinamica Lamborghini Attiva. It consists of computer-controlled air ducts at all corners for a huge increase in downforce. A hollow rear spoiler funnels high-pressure air through its supports to eliminate turbulence behind the car. No drafting required! The exhaust is also new, with tuned runners exiting higher up than before. This allows for 70 percent of maximum torque at only 1,000 rpm. The chassis is 15 percent stronger, which prompted engineers to beef up the suspension to match it. A revised interior offers new instrument displays and race-ready seats are optional equipment. The base price for US buyers has been set at $274,390, which isn’t bad for a record holding supercar. Exotics On Dirt Will Make You Cringe!